Growing up, Aaron had glimpsed his mother's tears many times. She didn't necessarily know he was watching but he saw how she yearned to be near her son--his brother--Moishe. Aaron had escaped the death sentence of the Pharaoh by being just old enough not to fall under its judgment. But Moishe had been the right age and was, therefore, condemned to death. Their mother--Jochebed--secreted him away and freed him from his death sentence by secretly giving him over into the hands of those close to the Pharaoh. Moishe was far away. He was not geographically distant from his true family but, rather, he was ideologically miles away as he grew up in affluence and wealth under the care of the daughter of the Pharaoh. When Moishe returned, Aaron met him along the way and revealed his identity more clearly. As Moishe tried to rally the people of Israel around God's calling, Aaron stood in the gap between the people and the agent of their deliverance. 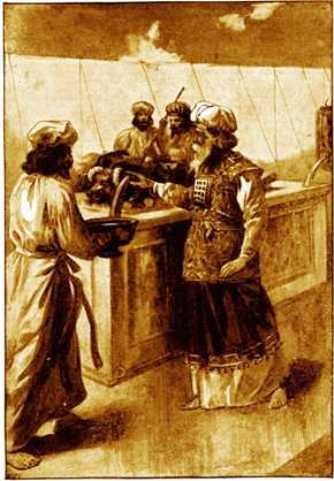 Aaron became a bridge between the deliverer they never knew and the people so crushed and beaten by Mitzrayim. Aaron's trust in Moishe allowed the people to learn to trust this wandering leader.Further, Moishe insisted that Aaron was to be his "navi" or mouthpiece. Moishe wasn't known for his eloquence and, perhaps, had a stutter but God had chosen him. God had called Aaron to stand in the gap between Moishe and the world and be the prophet and mouthpiece for Moishe. Aaron lived into this calling. Aaron's life and faith were far from perfect--he and Moishe did not always get along, his sons lose their lives by making the sacred profane, and he later built a golden calf for the people when they became fearful--but he must be remembered for standing in the gap for the people when Moishe was being called into the desert. Often, we focus on the great leadership of Moishe but it could not have been easy for Aaron to stay behind in the grip of Mitzrayim while his brother seemed to be able to escape it. Aaron did not leave his people and reminds us that God is not present solely in the wild and wonderful places but also in the places of death and oppression. Aaron--a High Priest of the Israelites--was committed to both his God and his people and held onto both even as they struggled with each other.